The STEEM price is down 1.40% verse the USD over the past 24 hours on lower volume ($8,829,440) as Bitcoin is flat at $9.3k and the broader market is mixed. STEEM is flat verse Bitcoin as Korean trading remains low at 29% of trading volume. 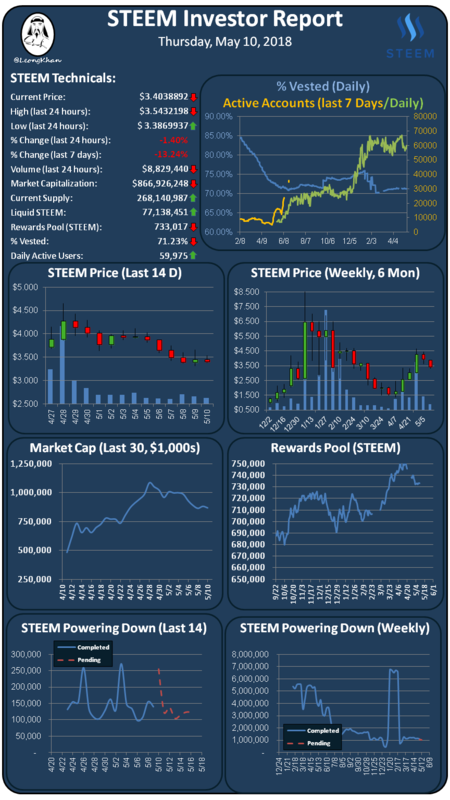 Without any new development news coming out of official channels, STEEM is likely to continue to track Bitcoin's movements for the time being. New account creation has spiked up to 9,700 new accounts created in the past 24 hours as Steemit may be catching up on the new account backlog. The % vested indicator is down at 71.23% on steady power downs and a break in power ups. Daily active accounts is up t 59,975 accounts executing transactions over the past 24 hours. SBD is at $2.73 on Bittrex which is still very elevated over the peg, receive you rewards in 50% SBD and then use the SBDs to buy STEEM on the exchange. SBD conversions are a waste of money again!